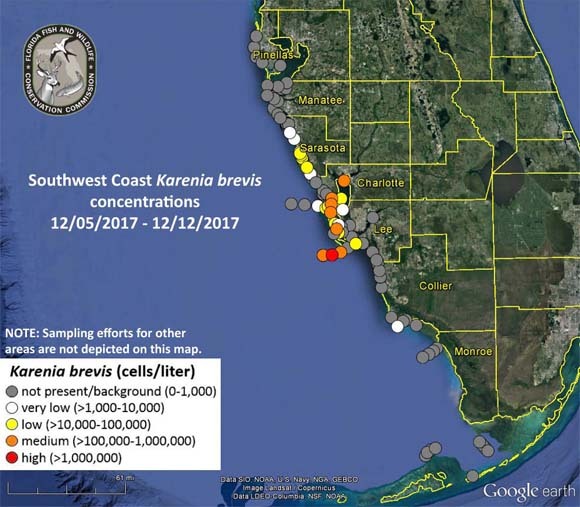 A bloom of the Florida red tide organism, Karenia brevis, was observed along Lee and Charlotte counties in Southwest Florida over the past week. In Southwest Florida, K. brevis was observed at background concentrations in one sample collected from Manatee County, background to low concentrations in fourteen samples collected from Sarasota County, background to medium concentrations in five samples collected from Charlotte County, background to high concentrations in twenty-one samples collected from Lee County, and very low concentrations in one sample collected from Collier County. Additional samples collected throughout Florida this past week did not contain K. brevis. Small-scale fish kills were reported along Charlotte and Lee counties over the past week. Slight respiratory irritation was reported along Lee County on December 13.